Caverion will be responsible for the technical maintenance of gas filling stations as well as for the remote centre services, remote management and technology HelpDesk services 24/7. “We are developing the Nordic gas ecosystem and adding the availability of gas for different customer segments. It is good to have a Nordic operating partner, Caverion. The use of gas is currently growing in all vehicle categories. 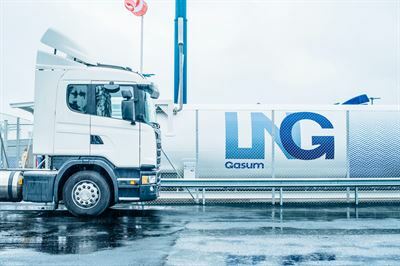 Gasum is investing in the construction of a total of 50 LNG gas filling stations for heavy-duty vehicles in Finland, Sweden and Norway by the beginning of the 2020s. The new gas stations will be located in logistics hubs and offer a cleaner fuel alternative for transport in the Nordics,” says Ari Suomilammi, Director, Circular Economy Finland, Gasum. “We are happy of this new cooperation where we can serve our customer in Finland, Sweden and Norway with a consistent and comprehensive service concept using our local experts. The goal of achieving a carbon-neutral society requires a good deal of measures, and we are contributing to creating opportunities for low-emission transport,” says Thomas Hietto, Head of the Services Business Unit at Caverion. Driving gas-fuelled cars is expected to increase considerably in the next few years. In 2018, there were approximately 6,300 registered gas-fuelled cars in Finland. According to the National Energy and Climate Strategy 2030, the number of gas-fuelled passenger cars in Finland in 2030 should be at least 50,000. New gas filling stations are being constructed at a fast rate in all Nordic countries.